Following on from our last blog post looking back at UK Games Expo, today we have another! This time from Ciara at Decking Awesome Games. Why is this split from the previous post? Unlike Jen, Robin and Ethan, Decking Awesome had a very different goal: they were playtesting their upcoming game Dice Summoners. What was the experience of playtesting a game versus selling a game? Well, let Ciara share here thoughts with you. 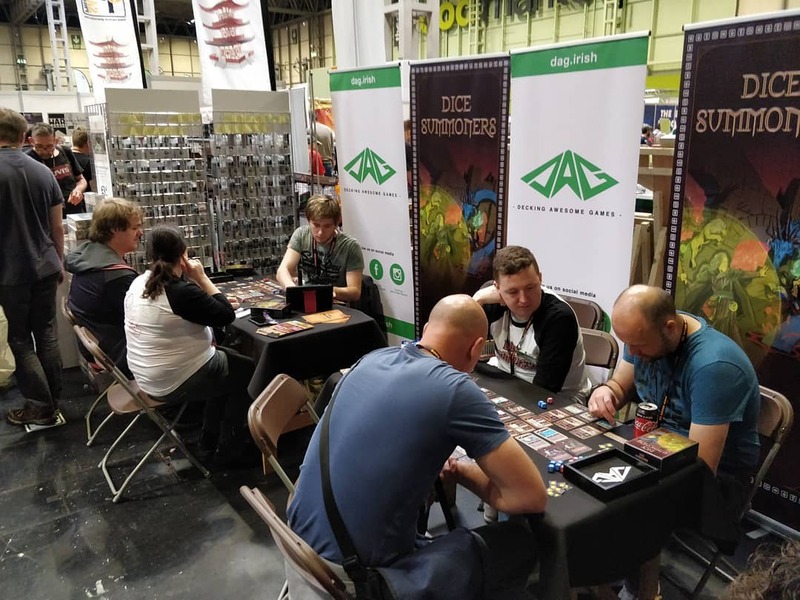 Decking Awesome Games headed out late Thursday night to attend our 2nd UK Games Expo event. Our energy levels were high and we were very excited for the coming 3 days. Our stand for the weekend was located by the restaurant in Hall 1 in a lovely spot near a variety of Kickstarters, small businesses, miniatures shops and a stone’s throw of some bigger players. Myself (Ciara), Eoin and Brian had headed over to advertise our upcoming game, Dice Summoners, and to playtest the heck out of it and that’s just what we did. Here is the game plan we went in with. Hand out flyers and sweets to anyone who was passing and would take them without scaring people away. Say a single sentence on the game to everyone to try and catch their attention. To anyone who slowed down, we gave a longer blurb on the highlights and what it’s similar to. To anyone who stopped, we tried to convince them to play the game and sign up to our mailing list. Friday started off slow and we found it a little hard to settle in to the rhythm. We had a regular stream of players but it felt like there were a few harsh criticisms. I will say this; there are a lot more designers playing on Friday while it is quieter. They give a lot of feedback based on how they would design the game to their own tastes. They give some great ideas too and their feedback is honest so it’s all worth taking in. I think this is the day you need the thickest skin for. A lot of players won’t play the whole game on Friday and speculate on how it plays out instead which means that the feedback might not cover some of the real life play. Saturday and Sunday had a much better flow, even with Saturday being several times bigger than Sunday and way more exhausting. Having thousands of members of the public going through the hall meant we had 2 demos playing constantly and interested on lookers a lot of the day. The feedback was really comprehensive overall, thankfully a lot more good than bad and it attracted the market we had hoped for (this was a big worry for us after our previous experience at the games expo). We found some design elements and rules that needed tweaking before we headed to Kickstarter, we got a lot of email addresses and return attendees asking after our game. So though we were very exhausted, we feel like we achieved our main goal. Outside of the work on our game, we also managed a few other interesting things at the event. We met and put faces to a lot of manufacturers we had wanted to contact or had been contacting up to the event. We got samples of a lot of products to guide us in our plan for manufacture. Particularly dice as they can be made in so many different ways. We met a lot of small publishers who gave us tonnes of advice on board game publishing. Most importantly, we got to see and play the latest board games at an amazing event! Thanks to Ciara for sharing her thoughts. Keep an eye out for Dice Summoners, which is going to hit Kickstarter later this year. We’ll be asking the team at Decking Awesome Games to keep us updated and we’ll let you all know when we know more! If you have any questions or comments for Ciara, let us know in the comments, or head over to the Decking Awesome Games Facebook page and ask there!